Often overlooked by most tourists and locals alike, the Bronx—one of five boroughs that comprise the city of New York—is rich in cultural and historical attractions. From the Bronx Zoo (the largest urban zoo in the United States) to the New York Botanical Garden (one of the most visited botanical gardens in the world), this borough has something for everyone. Visitors can explore historical locations (including where George Washington slept and where Edgar Allan Poe lived and worked), watch a game in one of the most famous baseball stadiums in the United States—Yankee Stadium—and sample delicious Italian food in New York’s real “Little Italy” on Arthur Avenue and New England style seafood at City Island along the edge of Long Island Sound. 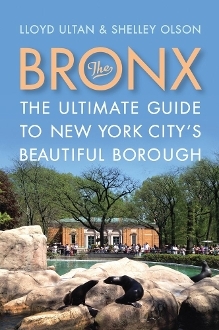 Author and foremost historian of the Bronx Lloyd Ultan and educator Shelley Olson have teamed up to create a handy guidebook with detailed maps that will provide all the information prospective visitors need for planning their adventures to famous and little-known sites, including the hours, admission fees, and directions to featured attractions.